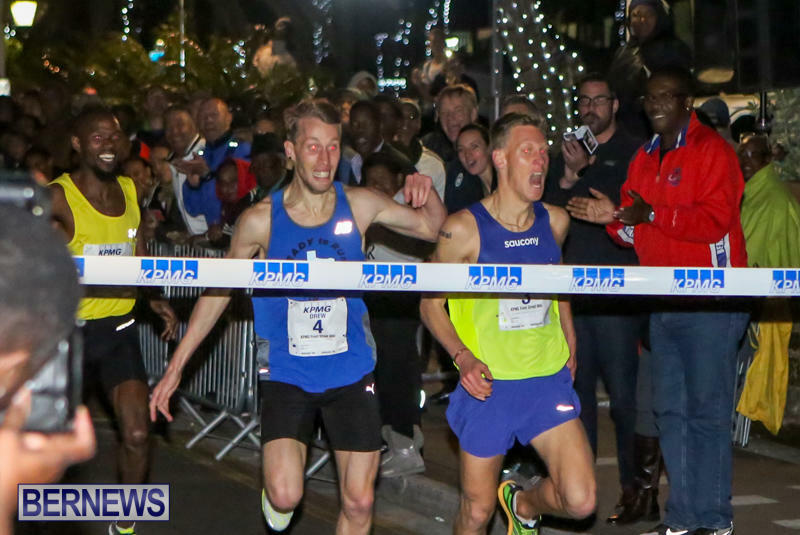 The 2016 KPMG Bermuda Front Street Mile tonight [Jan 15] saw a large crowd in attendance in support of the runners with the night ending with a photo finish in the men’s elite mile race. With only three men competing in the race, Adam Bitchell got the better of Drew Soucy as both recorded the same time of 4:26.51 while Jordan Chipangama finished third, clocking a time of 4:26.52. 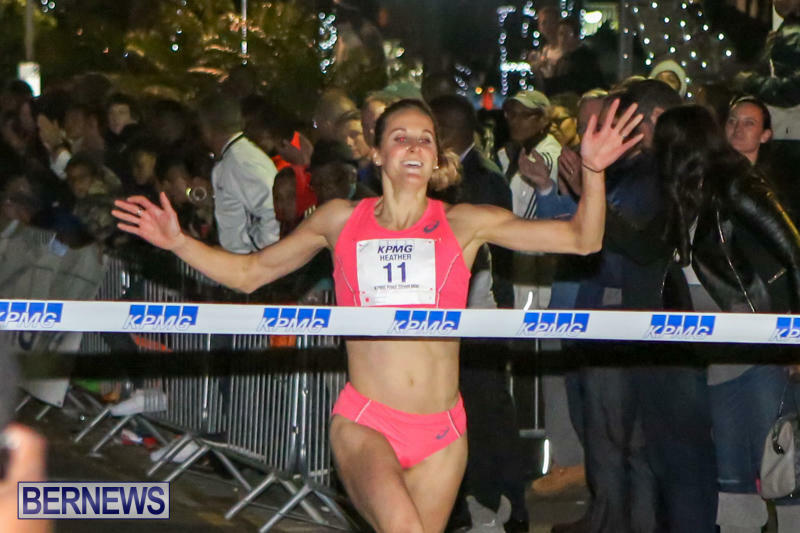 Heather Kampf retained her Women’s Elite title clocking a winning time of 4:42.68. Kenia Sinclair finishing second clocking 4:46.43 while Jamie Cheever finished third with a time of 4:47.68. Spencer Butterfield won the adult men’s race with a time of 4:33.99 while Tamika Miranda won the adult women’s race with a time of 5:20. The 2016 Bermuda Marathon Weekend continues tomorrow [Saturday] with the 10k race set to get underway at 9.00am, and the Bermuda Marathon and Half Marathon will take place on Sunday morning, with runners set to start from Front Street at 8.00am. But I can’t understand why the organizers did not allow some of the more accomplished local men milers to compete with the three elite milers since there were only three of them. To be honest, the winning time of 4:26.51 was not very impressive and I would not call those performances world class. In my opinion Tyler Butterfield, Stephen Allen and Christopher Hands should have been in that lineup. I think it would have made a more interesting race, and who knows, one of them may have taken a spot on the podium. Spencer. But I agree. And why just 3 in the field? Not like 4:20 guys are hard to find if that’s what the race has devolved into. Congratulations on an exciting race to the guys that ran and thanks for coming. Also to the ladies and all the locals. The local races have been the strength of this event for some time now. Yes, I meant to say Spencer Butterfield.